The entire team at PerioLife welcome you to our periodontics and implant dentistry practice. For over 20 years, we’ve been helping the people of Dallas and Fort Worth improve the beauty and health of their teeth and gums. When you choose PerioLife Periodontics & Implant Dentistry, you will receive personalized care from Dr. Randhir Kapoor and Dr. Rishika Kapoor – a father and daughter team. Both graduates from the elite dentistry school Baylor College located in Dallas, TX. Education has always been important to our doctors, and they continue to seek opportunities to stay up to date on periodontics and implant dentistry advancements. We offer patients a specialty dental practice specializing in periodontics, dental implants, laser dental treatment, crown lengthening, extraction/bone grafting, gum disease treatment, and many other services. All our techniques are minimally invasive. This decreases the discomfort patients feel and recovery time. Sedation dentistry is always available for those suffering from dental anxiety. We have state-of-the-art facilities in Dallas, Irving and Keller including the latest technologies for safe, effective results. Drs. 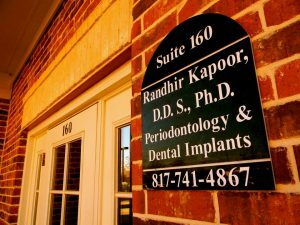 Kapoor and Kapoor along with their staff work together to deliver the finest periodontal and implant care in Dallas–Fort Worth. We offer three conveniently located offices throughout the Dallas – Fort Worth area in Dallas, Irving, and Keller. Call the office closest to you, stop by, or complete the form below to ask questions or book an appointment. We look forward to meeting you and providing the very best periodontal and implant dentistry care. Book an appointment now!